Back when Uber launched in San Francisco, it was heralded as a service that would disrupt the taxi industry by providing black cars on-demand via mobile phones. Thus far, the service has gained a loyal following, and expanded to a number of cities including Seattle, New York, Paris, and Chicago. 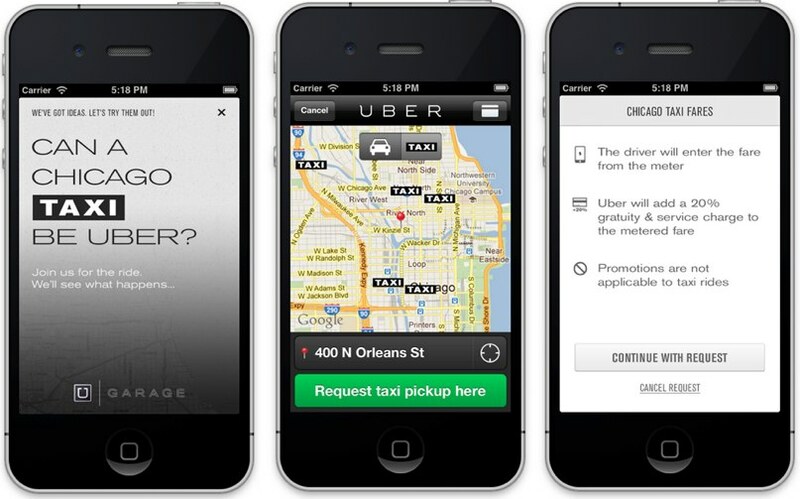 Today, we’re seeing a possible evolution of Uber with a new experiment in Chicago—using Taxis. Here’s how Uber works. The service allows you to order a black car to come to your location via an Android or iOS app. You can actually track your car as it comes to your location as the app tracks the car via GPS. Payments are handled automatically by charging the card you have on file (no swiping necessary and gratuity is included), and it costs at least 50% more than a taxi. But you can order comfortable transportation on demand, which to many, is well worth the premium. Today, Uber is debuting their own version of Google Labs, called Uber Garage, a workshop where the company will experiment with new ideas for urban transportation. The first project Garage is launching is Taxis in Chicago, where users will be able to see participating taxis, as well as black cars, on the their mobile apps as a transportation option. This is the first time Uber has experimented using different car types with lower price points. Why Chicago first? Uber’s CEO Travis Kalanick says it’s because the city has a larger than normal capacity (50% more cabs per capita than NYC) and low prices, which offers potentially high availability at a greater price point. The benefit for the consumer is that you can order a taxi from your iPhone without getting out your wallet, swiping a card, dealing with cash and more. The benefit for the taxi driver is that they can get more trips, as well as guaranteed tips via Uber. So when Chicago users pull out their Uber app now, select riders will find a way to see just taxi cabs that are close to them on the map of the Chicago area. Similar to the way you order a black car via Uber, you simply choose the taxi and waiting time that works for you, set your exact location and then you’ll receive a message when the taxi driver has arrived at the location. While only a few riders have the taxi service enabled today, this will be rolled out to a number of users over the coming weeks. We’re told that Uber’s car service option will remain the default in the Uber application. Uber says it will be recruiting taxis directly on a driver-by-driver basis. So far, taxi drivers in Chicago have been very responsive to the idea of Uber, says Chicago Uber manager Allen Penn. These taxi drivers simply have the Uber driver app open on their Android or iPhone and can see possible fares and rides coming in. Penn adds that Chicago is growing at a fast rate for Uber in terms of adoption, seeing 30-40 percent month over month growth. In terms of pricing and payment, drivers will input the meter fare from the taxi ride into the Driver application. A 20% charge to cover gratuity and service fees will be added to the fare. Kalanick says that taxis are getting a large portion of the 20 percent charge, with Uber’s take in the low single digits. He says that as Uber experiments with lower price potions, margins definitely go down, but feels this could be a compelling way for Uber to offer better personal transportation choices to users. Kalanick emphasizes that this is an experiment with different car types, and the company will be learning from this test. He says Uber will do a city by city analysis to determine if working with taxis makes sense in other urban areas. Other options could be trying black Camrys or Prius’ at lower price points. Uber, which just raised $32 million from Shervin Pishevar’s Menlo Ventures, Amazon’s Jeff Bezos, Goldman Sachs, Benchmark Capital, recently experimented with pedi-cabs and on-demand BBQ at South by Southwest in Austin. Kalanick says that he likes to think of things as “FedEx delivers packages tomorrow, but Uber delivers transportation in five minutes.” Obviously, this could be extended to deliver a whole bunch of other things, he says. “We are really excited about the potential of rolling out an urban logistics fabric and car types is the first step in this,” he explains. Expanding to taxis could also put some of Uber’s potential competitors on notice, including Europe’s Hailo, which is looking to expand its taxi network to the U.S.
For Uber, experiments with pricing have been a way to figure out what riders want and need. In the past Uber has tested reducing pricing in San Francisco, and dynamic pricing over New Years’. And with the new Garage, we’re going to see a number of more interesting ways Uber can try to satisfy the needs of both consumers and drivers in the future. And we’ll see Uber hit London before the Olympics this summer.